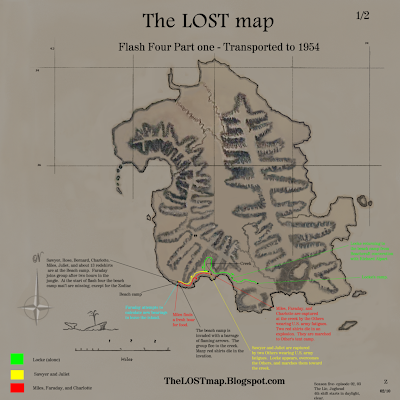 The camp is missing and the Losties are hungry. Faraday returns to the beach after missing for two hours missing. Faraday says he will try to figure out when they are in time so he can calculate a new bearing for the zodiac raft to leave the island. Miles finds a recently (3 hours deceased) dead boar for food. The soldiers are about to cut off Juliet’s hand, but Locke appears and save Juliet and Sawyer by overcoming the soldiers. On Island – Locke, Juliet, Sawyer have two “Others” dressed in military fatigues under control. Juliet wants to reconnect with the group at the creek. The captives talk to each other in Latin. Juliet interrogates them in Latin. Juliet realizes they are Others. On Island – Faraday, Miles, and Charlotte are taken captive and moved toward the Other’s camp. During the trek, Miles notices bandages on one of the captures hands (burn?). Faraday, Miles, and Charlotte arrive at the Others camp. Faraday pretends that the Losties, held captive, are from the U.S. military and needs to render the Hydrogen bomb, Jughead, inert. On Island – Miles professes his love toward Charlotte. As Richard undoes Faradays hand restraints, Richard remarks “ Whatever your supiors told your, I want you to know the truth. A month ago we found 18 members of an army battalion, right here, in our jungle setting up this camp, We gave them the opportunity to leave the island peaceably. They were not willing to do that. so I was forced to kill them”. Alpart tells Faraday he follows a chain of command. 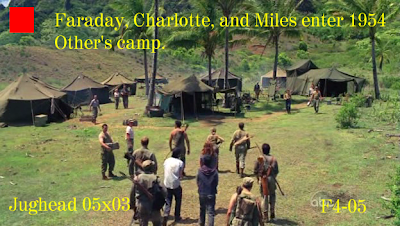 Locke, Sawyer, and Sawyer find the camp from afar. Locke decides to enter the camp to confront Richard Alpert about their last meeting (in which Alpart gave Locke a compass) as Sawyer and Juliet follow Faraday, who is being let to the hydrogen bomb at gunpoint by an Other by the name of Ellie. 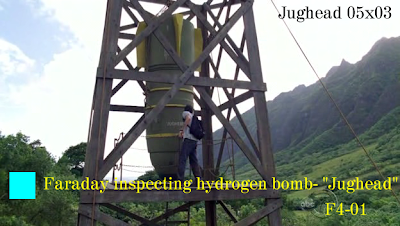 Faraday arrives at the hydrogen bomb ‘Jughead’ under gunpoint by Ellie. Faraday inspects the bomb and finds a crack in the casing. 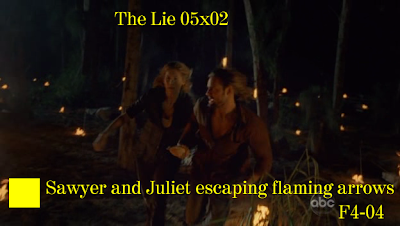 Sawyer appears with Juliet, surprise Ellis, and take her rifle away. Jones is actually Charles Widmore. 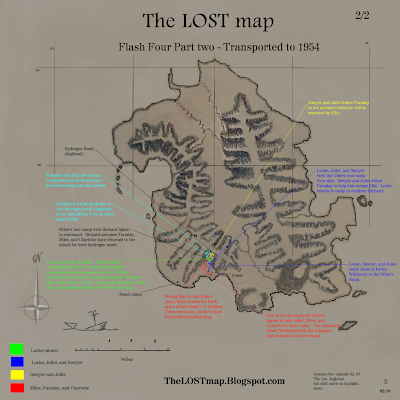 On Island 1954 - Locke gives Alpart the compass, which Alpart does not understand. Richard will not tell Locke how to get off the island, as it’s confidential information. Locke realizes a flash is about to occur. He tells Richard that he was born May 30th 1956 in Tuscan Arizona, USA. Locke encourages Richard to visit him at his pending birth.